Singhare ke Atte ka Samosa ( Water Chestnut Flour) is a mouth drooling and famous Indian dish which needs no introduction. 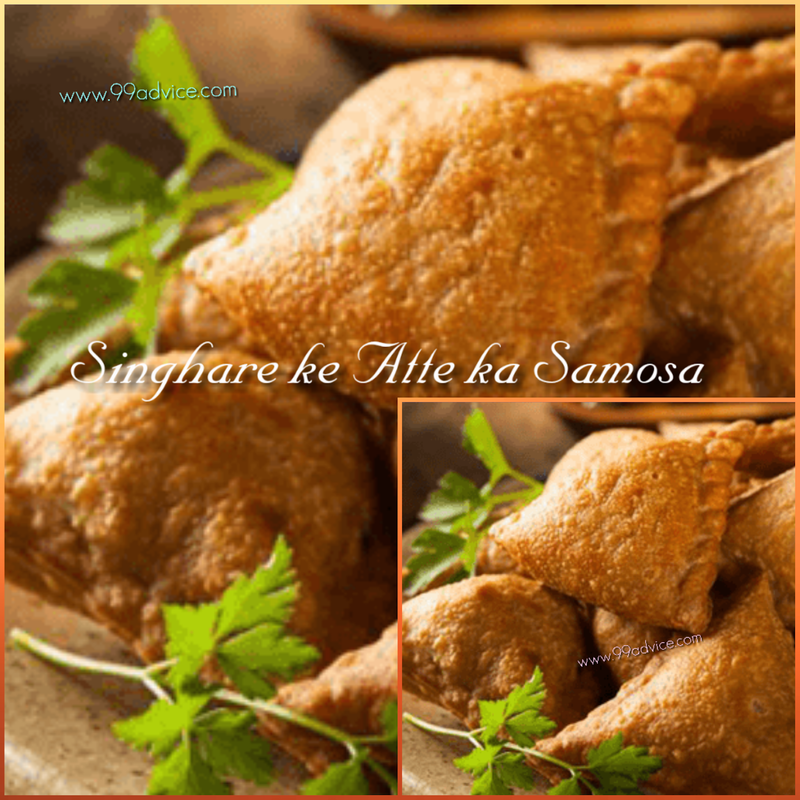 The snack which you like with tea, Singhare ke atte ka samosa, is a very delicious and simple recipe that you can easily prepare at home in Navaratri. You know that during fast, there are very few eating options but this recipe will make your problem a little easier. So, this time, try the Singhare ke aate ka samosa in Navaratri. Let's, have a look at the recipe. 1. Remove the shell of the chironji and grind it. 2. Heat two tablespoons of ghee in a pan with jeera. When it splutters, add chironji and other ingredients needed for filling. 3. Sauté on low heat till mixture is well fried. Turn off the flame and leave to cool. 1. Take a pan and add ghee, water, and salt to it. Bring the mix to boil. Once it starts to boil add atta and arrowroot after that cook it on low flame. 2. When the mixer starts gathering in the middle, keep it off from flame and keep it cool. 3. Then, roll the dough into a circle and cut it in halves. You can use dry flour or arrowroot if it sticks. 4. Take one edge, and wet it from the edge. Then join the overlap portion to form a cone. 5. After that, fill the cone with the filling & press the edges to seal it. Repeat the same process for rest dough. 6. Heat the Ghee in a kadhai & keep frying the samosas in hot Ghee till they turn golden-brown. 7. Now Transfer it to in a plate, samosa is ready to be served hot with Imli chutney. Try this vrat walla samosa recipe, and enjoy your Navratri fast. While making samosa, you can also use paneer and potato filling instead of the filling of chironji.